With RingCentral and Chrometa, say goodbye to underbilling! Do you know how much time you spend making and answering calls every day with your RingCentral VoIP phone? You probably spend several hours each day reviewing documents with a remote client, being on the phone for a court hearing or sitting in a conference call… For the majority of lawyers, the total time varies between one and three hours. No matter how diligent you are at keeping a log of all your calls, chances are you sometimes forget to log a call… or two… by no means a big deal at the end of the day, but a pretty big deal at the end of the month. And even if you have unrivaled timekeeping skills, reconstructing your time at the end of the day (as it often happens) can be difficult and time consuming, resulting in delays and possible errors. While most people are usually pretty good at remembering what they did over large blocks of time, they tend to forget all the short calls. Our mission at Chrometa has always been to help you stop underbilling, so it is only natural to also focus on tracking phone calls. As you may know, our Android time tracking app integrates seamlessly with Android mobile phones since 2013 and you’ve got all your calls in an automatically built time sheet thanks to our dedicated app. Landlines and iPhone calls, however, do not offer a similar option – Apple does not allow any work time tracker to keep a call history, and landlines usually don’t have a public API. But here is some good news: if you are using RingCentral, it is in fact now possible to track your landline and iPhone calls thanks to the newest integration with Chrometa. After the initial setup, Chrometa imports your RingCentral contacts and syncs them with your existing clients’ contact information. Once created, new contacts are automatically added to your Clients list while existing contacts are kept in sync. Ten (10) minutes after the end of a phone call, the phone call appears in your Chrometa time sheet. That’s right, automatically. You no longer need to write down the exact number of minutes you just spent talking on the phone – and with whom – every time you hang up. Now, that’s nothing short of a holiday miracle! The Chrometa – RingCentral sync happens in the background, you do not need to be logged into Chrometa or even have Chrometa running on your PC or Mac for the sync to happen. Fist Connect Chrometa and RingCentral from the Integrations page. Create rules based on the contact name, phone number and/or extension. Your calls are then automatically to the client. You’re just one click away from the Invoices (or exporting to your favorite Invoicing/Practice Management system). Review your call log in the Timeline and Time Summary views. The time entry contains all the call details you need to invoice your work: the start time, call length and the contact you called or who called you. PS: Our development team is actively working on adding text messages to the sync process. Also keeping the RingCentral address book in sync with the list of clients in Chrometa, so stay tuned to future announcements! If you’re using Clio for your practice management, integrating Clio with Chrometa streamlines your workflow. The new Clio API is faster, more secure and adds automatic sync with Chrometa thanks to many new useful features like Webhooks, Bulk Actions. If you’re not yet familiar with Clio, Clio is a practice management system that offers all you need to run a law practice from intake to invoice, with powerful tools to manage cases, clients, documents, bills, calendars reporting, and accounting. Integrating Chrometa with Clio will automatically build your Clio Timesheet. Clio’s new features that you can directly use from Chrometa include Webhooks and Bulk Actions. With these, syncing is done in real time and is faster; only new and updated matters are imported or updated in Chrometa. Tracking in Greek is so easy! We also upgraded our clients/projects and rules engines to [link] to allow clients, projects and keywords in different locales. New features and improvements are being introduced all the time to make your tracking with Chrometa more accurate, faster and easier to use. To find out more about what is contained in each release, subscribe to feeds from this category. What sounds like the memorable “Don’t think! 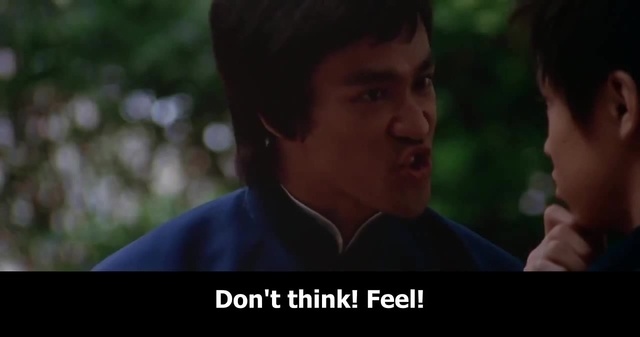 Feel!” Bruce Lee line is actually the main lesson from Peter Drucker’s The Effective Executive. I recently read this classic after finding out it was the number one book recommendation by Amazon CEO Jeff Bezos. The book is concise and starts with the good news: effectiveness can be learned. In it, Drucker explains that in his forty-five years of experience he has never seen a natural effective leader or executive. Effectiveness is a skill and we learn it the same way we learn any skill: practice, practice and practice some more. He even lays out the five habits we need to acquire to become more effective. Our most valuable asset is time. Almost anything that is lost can be gained back: money, friendships, health… Once we lose time, it’s gone forever; so, we must learn to optimize it. Drucker lays out the three time management principles: Track, Manage and Consolidate. Contrary to popular belief, we must track before planning. Tracking our time will reveal the time wasting activities, all those periods of time when we’re not in “Deep Work”mode (another great book by Cal Newport, by the way), checking our emails for the 10th time, toggling between the draft document we have to send and the latest headline from our favorite news website…. At this point I can’t help mentioning Chrometa! Chrometa will do just that: give you insight on what you and your team are actually doing, shed light on the billable work while also showing an unbiased tally of distractions. Distraction is unfortunately the norm, not the exception. According to this survey, the average worker wastes up to three hours a day. That’s 759 hours each year! This is not only affecting business revenue but also employee motivation, which has a cost in the long run. And finally consolidate: we must create large time blocks during which we focus on one single activity, which is what Drucker calls “deep work”. I was actually surprised to find out that Drucker recommends half a day to two weeks of deep work. Then I remembered that my most productive days are those when I worked on one thing only, until completion. How are we adding value to our customers? How are we keeping our employees motivated, happy and productive? How are we increasing the owner’s return on investment? 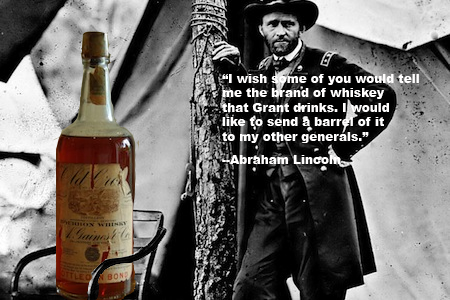 Abraham Lincoln famously said that “if the only weakness of General Grant is him drinking then I will gladly send him a case of his favorite drink, just as long as he keeps on winning”. In today’s world, this translates into assigning the most qualified person to each position. Rather than trying to minimize any weaknesses among our teams, we should maximize the existing strengths until all weaknesses become irrelevant. Obviously there are some weaknesses that need to be addressed, chief among them are the lack of integrity and character. This habit is so powerful that Stephen Covet mentions it in his bestseller The 7 Habits of Highly Effective People and wrote a whole book titled First Things First. It’s a simple and powerful habit: do the first things first, second things? Not at all! 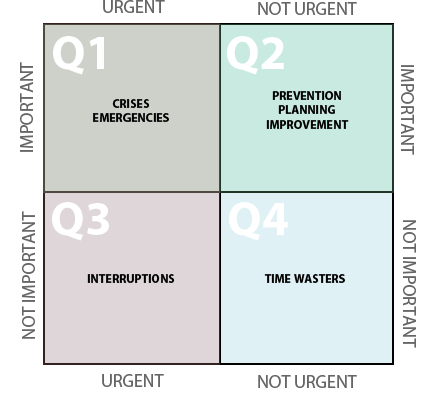 The general idea is to categorize your planned activities within one of the four quadrants in the illustration below. Examples include: fire drills, deadlines, client/deal emergency, etc. Best practice: avoid by being proactive (Q2) and manage effectively & efficiently once the Q1 event arises. Examples include: email interruptions, useless reports, long-winded meetings, etc. Best practice: include (for a “mental break”) but limit extensively. QUADRANT 2 (Q2): This is where you want to spend most of your time. It’s pro-active and value-additive to yourself and your environment (work, family, social circles). Examples include:productive work,quality time with friends and family, proactivity, meditation, working out, proper nutrition, relationship building, reading & education, creativity, etc. Best practice: spend the vast majority of your time in Q2. This is obviously a simplified way to categorize activities as each task could also be judged by the level of required effort, available resources (delegating work to your staff for example), complexity etc. It is good to notice thoughthat we usually spend so much time and energy in Q1 that we get burned out and seek relaxation in Q4. So next time we found ourselves in Q4, let’s quickly shift to Q2. I dreaded reading this chapter at first. Business articles about decision-making processes tend to be complex, long and boring but this one was a nice surprise and could be summed up in three words: Less is More. 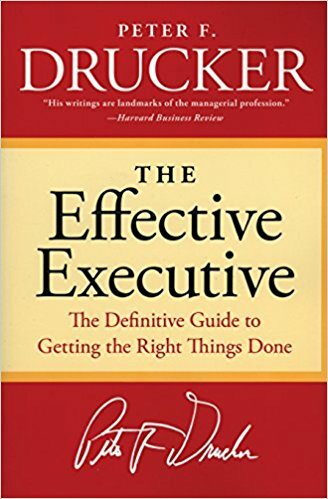 Drucker states that effective executives make fewer decisions by identifying what he calls “Boundary Conditions”. In layman’s terms it means to find the one decision that makes the rest easier or irrelevant. Drucker relays the story of New York power outages in 1965. One night, The New York Times had to move their printing over to New Jersey. This left them with only an hour and a half to print the papers. However, just as the paper was going to press, the executive editor and his assistants began arguing about the hyphenation of a single word. This argument took 48 minutes to resolve, so, in the end, only half of the press run could be completed. While to most this seems like an egregious waste of time, the boundary conditions of the paper were: The New York Times is the standard-bearer for American English grammar. In this light, the decision was correct and aligned with the values of the organization. What a great way to end the book: boundary conditions help us make effective decisions once (and only once) as we concentrate our energy (first things first) on making our strengths so strong we make the best contribution to our organization. So join us here to identify your time wasters (dreaded Q4 quadrant) and take an honest look at how you and your team spend the day, plan accordingly and play on your team’s strengths to make this an effective and happy day! 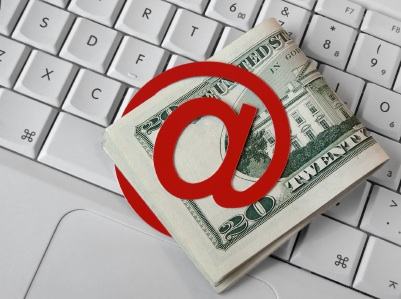 our research team found that email reading and writing accounts for up to a third of the total billable time. make timekeeping at painless as possible. client/project, Chrometa will automatically move time entries with the email address to the client. automatically filed under the client’s timesheet. Microsoft Outlook activity has always been a good indicator of how much time you spend working on a project or matter: the work you do on any given day is very often linked to the emails you read and compose; the meetings in Outlook calendar are time spent working for a client. With the Chrometa add-in for Outlook, time spent on emails you are reading, composing or replying to is automatically captured. Now what if you wanted to go back in time, i.e. before Chrometa was on your PC? Well, thanks to Outlook exports, this is now possible! In the Create or Open Outlook Data File dialog box, in the File name box, type a name for the file, and then click OK.
And finally click on “Process” , your emails are now time entries in Chrometa! To turn on automatic categorization, add email addresses to your Chrometa clients and Chrometa will assign each email to the correct client. Chrometa App for Android: Automatic syncing is here! As professionals, we all know how important being able to log professional calls is. After all, we spend up to 30 hours of our work time on calls and text messages each month. Considering that professionals charge an average of $150 per hour, I’ll let you do the math (yup, you are right, that’s roughly $5,000)! Those hours are hours that MUST be tracked and logged. So, with that goal in mind, we set to create a Chrometa app for Android that logged phone calls and text messages, and assigned them to the relevant clients and/or matters. And the app did just that!. The challenge, though? We needed to remember to open the app on our phones and tap the “sync phone calls” button (when we needed the calls synced with our account)! With our crazy workloads and schedules and with timekeeping often being such a tedious task, having to remember to do all that was definitely not ideal. Worry no more! The new version of our Chrometa app for Android now automatically syncs your call and text history for you. Every two hours, your calls and texts are automatically sent to your online Chrometa account, where, as per the rules you created, they are automatically assigned to the relevant client. If you already have the Chrometa app on your Android smartphone, simply go to the Playstore and update the app. If you do not have the Chrometa app on your Android smartphone yet and wish to install it, go to the Playstore and search for “Chrometa”, then click on “install”. We are pretty sure that this update will make your billing process a little easier and save you some valuable time but feel free to share your thoughts about it with us. 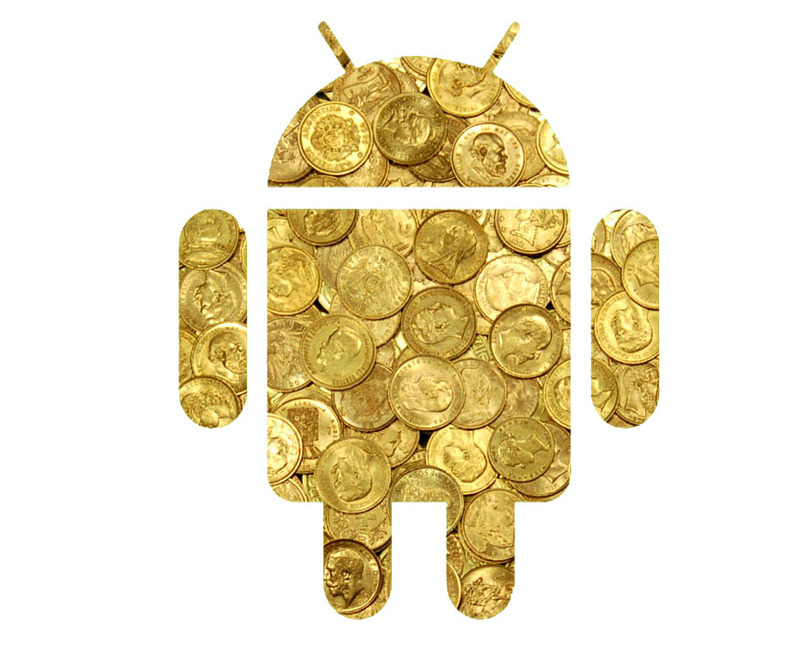 With the new version of our Chrometa app for Android, you don’t have to lift a finger! Well, actually, you do, but only to make a call or write a text ;)! Billable hours – that little phrase is music to the ears of many an individual. For quite a few of us, an hour worked is an hour paid; from office workers to high-powered professionals, keeping track of how long you’ve been on the job (via a time recording app) directly impacts how much you earn. In many cases, timekeeping is handled in a centralized manner. The generations-old practice of factory workers – or more accurately, in our day and age, retail employees – punching a time clock to keep a record is still used today, but it’s not appropriate for all settings. Freelancers who bill their clients by the hour, for example, are required to keep careful records themselves. Likewise, legal professionals like attorneys need to keep track of how many billable hours they spend on each of their client’s cases. So if you’re not punching a clock to keep track of your billable hours, what’s the best solution? Some people keep written records of the time spent on scraps of paper across their desks, while others enter time spent into Excel spreadsheets. Others use time-keeping software on their computers, or simply the stopwatch function on their mobile phones. While many of these solutions may work, there are better ways to record time for billing purposes – and the best way is Chrometa. Beginning its life as a service that tracked your time while working on your PC, Chrometa was already distinguishable from other time keeping software programs because it was incredibly advanced. Instead of requiring manual timer starting and stopping, Chrometa’s desktop time recording app provides seamless, passive time keeping, using keyword-based rules to automatically sort, categorize, and record time spent writing emails, answering phone calls, attending meetings, or doing any work for any client. But not all professionals spend time chained to their desks. In fact, thanks to mobile working and connectivity, many work outside of an office environment, making it impractical to use a PC-based time keeping app. That’s why Chrometa designed an innovative mobile app to record billable activities anywhere and everywhere. The mobile app then automatically syncs with the user’s Chrometa account, ensuring that billable hours remain as accurate as possible. Whether you’re using the desktop app or the mobile version, Chrometa offers the ability to export your time records in a number of different formats. The app is fully integrated with Xero, Sage Timeslips, QuickBooks, FreshBooks, and Basecamp. Chrometa can also export to CSV or Excel spreadsheet, perfect for use in corporate billing programs – and if your firm or company uses a homegrown system or other third-party application, Chrometa’s open API makes manual integration easy. Chrometa provides an invaluable service, but a time recording app that’s priced out of your budget is no help to anyone. That’s why full access to Chrometa – including access to the service on one computer and one mobile device – starts as low as $19.99 a month for an individual. Team rates are identical – $19.99 per member – and services include email and phone support, live chat support at least six days a week, and a free 30-day trial. On top of Chrometa’s affordable pricing model, the service offers high levels of safety and security. Chrometa maintains cloud-based records on servers with 99.9% uptime, 24/7 monitoring, and daily backups, and security features include 128-bit encryption. Additionally, Chrometa maintains a copy of your time recording data locally on your PC or mobile device to ensure unerringly accurate time entries every time and all the time. Thanks to this time recording app’s flexibility, functionality, and affordability, Chrometa makes an excellent choice for not just freelancers but entire firms and companies that need to manage billable hours across a wide variety of clients. The added safety and security features are more than just icing on the cake – it’s more of what sets Chrometa apart from typical time keeping methods or even rival software programs. No one wants to sell themselves short when it comes to billable hours. At the same time, the importance of charging clients and customers accurately for time spent working on projects cannot be overstated. Yet using a traditional time tracking solution creates stress in a freelancer or an associate by adding yet one more task to an already high workload. Whether it’s recording work time manually with a pad and paper or a stopwatch and a spreadsheet, the pressures created to ensure billing accuracy can often eclipse the substantive work being done. Having to record time throughout the day by hand is more than a mere annoyance, especially while trying to support clients and customers in a fast-paced working environment prone to regular interruption; it soon becomes an Atlas-like burden. The result of inaccurate time keeping amidst the unavoidable chaos takes an unmistakable toll. Research has shown that many professionals only bill around 67% of the hours they work. This means that you’re only billing two hours for every three worked. This has a monetary cost for not just yourself but for the company or firm for which you work. Meanwhile, Chrometa is so accurate – and so seamless – that using it can increase your billable time by 20% or more while actually working fewer hours. This provides benefits to everyone – better service to your clients and more accurate billed hours for yourself. The transformative power of Chrometa can completely redesign your freelance business or professional practice practically overnight. Thanks to its ability to work across both mobile and desktop platforms seamlessly, simplify and automate time entries, and export time data in formats that can then be used to generate professional invoices or accurate time sheets, Chrometa is hands-down the among the best time tracking tool available today. Combined with its highly affordable pricing structure – and the fact that you can access a 30-day free trial – Chrometa is easily the preferred solution for anyone who values accurate time keeping in a professional environment. Click here to start a 30-day free trial of Chrometa now. There is no doubt that every entrepreneur has to work hard—very hard—to achieve success. They need to learn new tasks, be able to respond to changes continuously, plan for the future, and manage all the employees. But with so much to do at one time, how are they able to work efficiently? How are they able to manage all the workload? So, if you are wondering the same, here are a few ways how successful entrepreneurs manage their workload. They always concentrate on the most important 20 percent of their workload, because they know that this 20 percent will contribute to more than 80% of its value. They know the importance of dealing with one job at a time. Therefore, they make sure that when they pick one task, they do not leave it midway and start with another. Once they finish it, they prepare for the next one. They may be preparing a to-do list on a simple notepad, or using a time tracking software on their iPhone to organize their affairs. The important thing is that this way they have a reminder set for their everyday activities. They know which ones are urgent and important, and which ones can be left to do later. So, it gets easier for them to focus on a single activity at a time. Looking at their to-do list, they set a realistic deadline for each task. They are well aware of their capabilities and know how long it will take them to complete each task. This is why they set achievable targets that keep them motivated. For example, if they get a client who asks for an early delivery, and they know that they are not going to be able to serve them on time, they do not accept the order. They know that overpromising will only ruin their image, which is bad for business. They always keep a log of their workload through time keeping applications. These applications help them know how many times they got interrupted and their focus shifted while performing a task. This helps them prepare better for other similar tasks in the future. So, if you want to organize your affairs and boost your productivity, Chrometa has the most effective time tracking solution for you. For details, email us at sales@chrometa.com or call +1 916 546 9974. Not everyone is naturally blessed with outstanding time management skills. Employees and business managers are often overwhelmed by the crippling burden of unfinished projects. Working late to meet deadlines is not the solution. It decreases your productivity by stressing you out. To be more efficient at work, business owners and employees have to come up with effective time management plans. Unfortunately, we often end up making simple mistakes that reduces the potency of our time management plans. What are common time management mistakes? It is impossible to create a good time management plan if you are not even aware of all the tasks you are responsible for. Your to-do list must list all your tasks in order of their priority. Needless to say, focus on the high-priority tasks first and then work your way down the list to the low-priority ones. Proper time management plans require clearly defined goals. They give you something to work toward and help you assess your progress. Clear goal setting also enables you to know what resources you’ll require for your work and how much time you’ll need for completing it. Inability to handle distractions can cause huge time wastages. Distractions at work can be due to various causes: emails, phone calls form friends, etc. Managing distractions effectively can help you save valuable time which can be utilized properly by engaging in productive activities. Taking on too many projects can often cause your productivity to drop. Be realistic while creating your time management plans. Being overambitious and adding too many activities to your to-do list will backfire and drag down your efficiency. Delegate wherever possible and avoid micromanaging! Contrary to popular belief, multitasking reduces your efficiency. Focus on a single task rather than distracting yourself by taking on several tasks simultaneously. Lack of concentration is one of the biggest enemies of effective time management. Keeping yourself occupied with unnecessary tasks will not help you achieve much at work. Be sure to always focus on what matters the most. Most employees make the mistake of being sidetracked by low-priority tasks that take up most of their time and prevents them from devoting more of efforts on important tasks. Proper time management can easily be achieved by using the latest time tracking apps. Chrometa is one of the finest time management software in the market. It enables business owners and employees to make the best possible use of their time by properly scheduling their activities. To learn how Chrometa can improve your productivity, call us at +1 916 546 9974, or send us an email us at sales@chrometa.com.